Your search for a nourishing, all-natural hair pomade ends here. 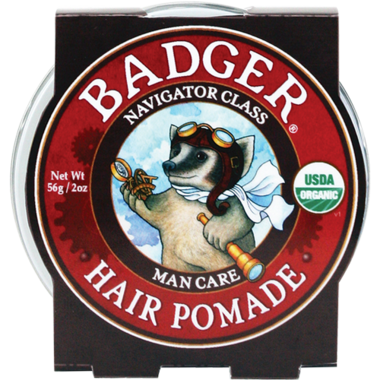 Badger Navigator Class Man Care Hair Pomade has soothing Babassu Oil that penetrates quickly with no greasy after feel. Coconut Oil gives a high shine and medium, versatile hold. Together these super emollient oils help hydrate and fortify hair over time. No parabens, synthetics, GMOs, chemical or any other harsh ingredients. Directions for use: For best results, apply a small dab or pomade evenly to damp or dry hair. Style as desired. Enjoy a medium hold with great shine. The more you apply, the greater the hold. Ingredients:*Orbignya Oleifera (Babassu) Seed Oil, *Cera Alba (Beeswax),*Butyrospermum Parkii (Shea) Butter, *Cocos Nucifera (Coconut) Oil, *Helianthus Annuus (Sunflower) Seed Oil, *Citrus Aurantium Bergamia (Bergamot) Peel Oil, *Vetiveria Zizanoides (Vetivert) Root Extract, *Santalum Album (Sandalwood) Oil, *Elettaria Cardamomum (Cardamom) Seed Oil, *Piper Nigrum (Black Pepper) Fruit Oil, Tocopherol (Sunflower Vitamin E), *Vanilla Planifolia (Vanilla) Fruit Extract, *Commiphora Myrrha (Myrrh) Resin Extract. Doesn't feel too heavy and washes out nicely. A lot of shine which is the 50s style it's going for. Citrus smell is descent. My husband really likes this product. The smell is super fresh and not artificial and it actually works- bonus! Clean AND does the job! This is the first time I try using a hair pomade. I've always used hair gel but wanted something different. First off, I enjoyed the smell...light citrus. Used a bit but I'm not sure if I like it. Cannot style my hair as I usually do and for me it definitely leaves an oily film. Love the ingredients and it seems to be a quality product but I'm most likely not a good candidate for it. Really happy with purchase - wanted to find something for special occasions for my boys that was all natural and this fits the bill. Has a nice scent to it and doesn't leave hair greasy. Great pomade for a light to medium that doesn't feel greasy. Has a light and pleasant natural scent and doesn't irritate my scalp either! I highly recommend it and the packaging with the badger is pretty neat!